When we arrived in Georgia we had some free time so we checked out a local park that had a beautiful beach! A few of my Alpha Phi sisters also went on the trip so we, of course, had a mini photoshoot with the lifeguard stand, ahah! I also LOVE this outfit! Navy blue and mint green compliment each other so well! For one of the nights we went out to dinner at a local restaurant and this was their sign! I thought it was absolutely hilarious – and, after eating there, I see why they had to include intelligent in the job description. Yikes. All the Alpha Phi’s on site working hard! 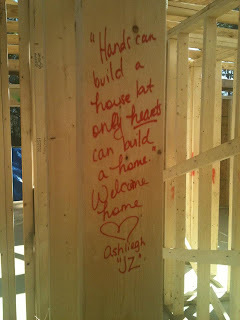 The last day of building we always bless the house by writing inspiration quotes on the studs. 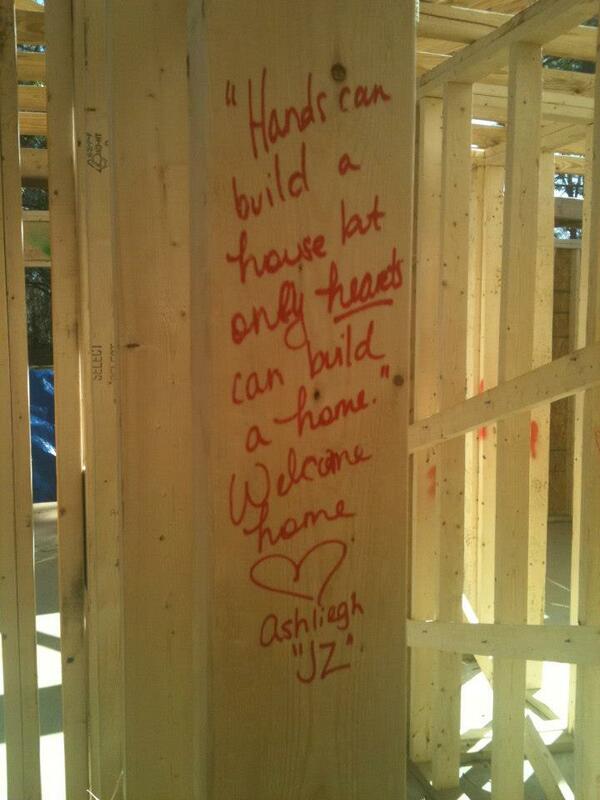 This is one of my favorite quotes for Habitat For Humanity! Also, my nickname is “Jarzi” because of my last name but I gained a new/shortened nickname, “JZ” during the trip as well! 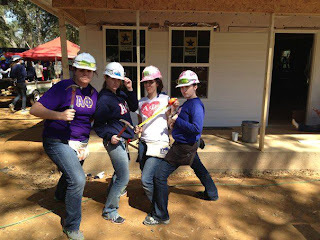 On the last day of the trip we went to Habitat for Humanity International’s Global Village. This was one of my favorite parts of the trip. At the village they have life-size models of the different houses Habitat for Humanity builds in different countries. It was definitely an eyeopening experience! We also were able to visit previous homes we built in years past! This photo is the house we built last year. It’s not completely finished yet (mostly interior work). These are the returning students from last years trip! This is the house we built during my first Habitat for Humanity spring break trip and the returners from that trip! The annual spring break trip is always such a refresher and so inspiring to work with so many students who are passionate about service and Habitat For Humanity and I can’t wait for next years trip!